Events communicate insights as to what might have caused results for a specific data point(s) to be unusually high or low. For instance, a bad snow storm on a Saturday might cause greatly reduced in-store sales for that day, but may also result in an increased volume of phone orders. 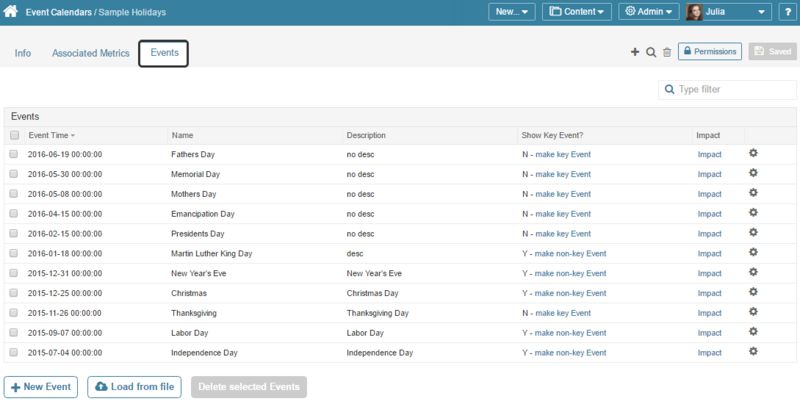 Event Calendars: Provide the framework and rules that govern the application and display format of Events to Elements. See Define an Event Calendar for more information. Events: One or more individual occurrences associated with the specific Event Calendar. Any individual Event may be designated as a Key Event and will be shown on all associated Element's charts. See Understanding Key Events for details. Otherwise, Events will display on Viewers of those Metrics and Multi-Metrics for which the Event is determined to be "Impacting", for example: If the value(s) for a date or range of dates are "Statistically Significant"; (outside of the Standard Deviation settings), the Event is considered to have impacted the result. 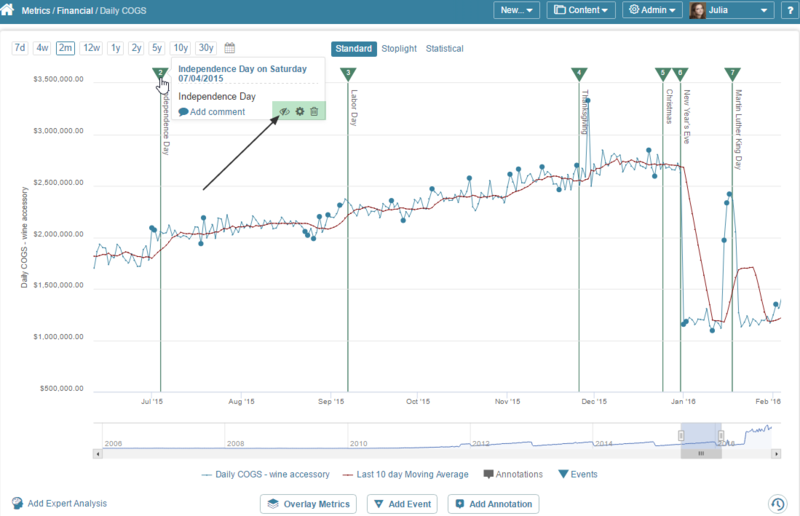 This example uses an Event Calendar of 'Sample Holidays' that is created to determine if these planned Events have any significant impact on Website Visitor Activity. Add Categories to which this Event Calendar should be applied. This table and button are different depending on whether you apply this Calendar to Topics, Measures, Categories or Individual Metrics. 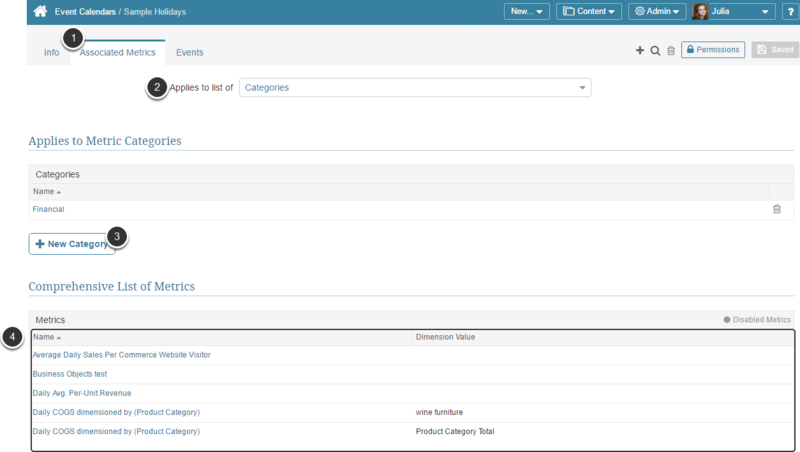 Data about Events can be collected automatically or manually in the Events tab. Event Impact: is automatically calculated by the allowed standard deviation in the Statistical View. Standard Deviation is assigned in the Metric Viewer > Charting tab > Set Statistical view field. When the data point falls outside the statistically acceptable threshold, system interprets it as an Alert. If such Alert date coincides with the date in the Event Calendar, this Event becomes impacted and current date and the following date are added to the Potentially Impacted Metric Values list.